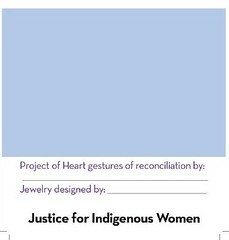 After creating your necklace, the final touch is to attach a tag. 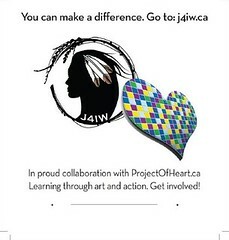 The tags educate and offer the opportunity for learners to become allies with Indigenous women and children. The quotes on the inside of the tag highlight the voices of those who are too often not heard. They are also a way for learners to share their new knowledge with others. • A special design created for this fundraising season. 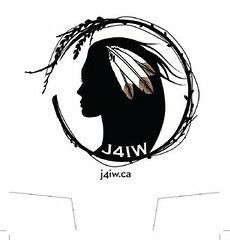 This tag recognizes the collaboration between J4IW and the First Nations Child and Family Caring Society. 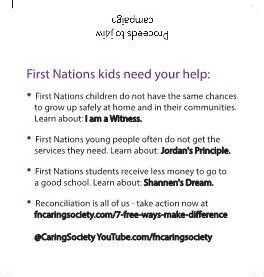 It features a “spirit bear” logo as well as information about the Caring Society’s major campaigns (I Am A Witness, Jordan’s Principle, and Shannen’s Dream). 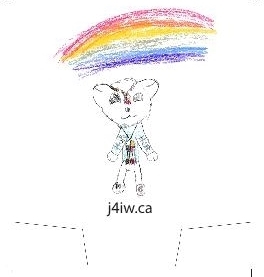 Both versions of the tags are available by contacting J4IW at [email] . 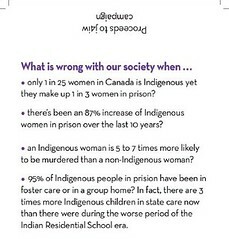 Found below are the four panels of the Caring Society “Spirit Bear” tag design, followed by the four panels of the original design.